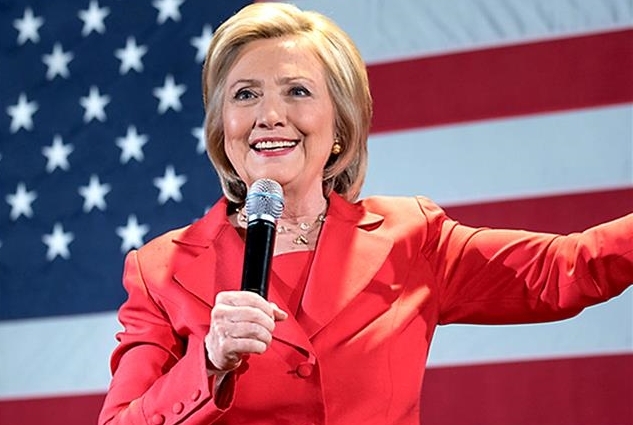 URBANDALE, Iowa (AP) – Hillary Clinton had just finished detailing the dangers of terrorism, recalling tough calls in the White House situation room as secretary of state and lashing out at her Republican rivals for threatening the safety of Americans. But when an Iowa man broke into her riff with a question about how the country could confront a new wave of hate and fear, her response sounded less like that of a commander in chief than of a soothing self-help guru. “We’ve got to do everything we can to weed out hate and plant love and kindness,” she told a crowd of several hundred. The lovey-dovey message seems surprising coming from a Washington veteran so battle-hardened that she often cites Eleanor Roosevelt’s mantra about women in public life needing “skin like a rhinoceros.” But as she grapples with Donald Trump’s prominence in the Republican race, she’s embraced a little love and kindness as a near-constant refrain. Clinton has been a divisive figure since the era of “the vast right-wing conspiracy,” as she called critics. In a Democratic debate in the fall, she said she was proud to have made enemies of Republicans. But she’s also talked about compassion for decades, dating back to her earliest days as first lady when she decried a national “crisis of meaning” in a 1993 address. And the importance of compassionate communities has long been an underpinning of her domestic policies. Today, Clinton rarely ends her remarks without asking her audience to consider adding some “love and kindness” to their daily lives. The line entered her stump speech as an ad-libbed aside during an address to mayors days after the Charleston church shooting that killed nine in June. “It may be for unusual for a presidential candidate to say we need more love and kindness in this country, but I think that’s exactly what we need,” she said in Salem, New Hampshire, on Tuesday. Her approach – and the implicit contrast with Trump – has attracted some people. Her campaign has tried to hold up Trump as emblematic of the Republican Party, stressing that while his rhetoric may be harsher than that of his rivals, his positions on immigration and more are shared by the entire field. Trump has accused Mexican immigrants of being rapists, called to ban Muslims from entering the country and mocked the appearances of his opponents, women and a disabled reporter – rhetoric that is in fact distinct to Trump and has been denounced in many cases by his party rivals. While Trump’s talk has drawn support from GOP primary voters, he lags among women. Clinton has assiduously courted women, with the historic nature of her candidacy, economic policies such as expanded family leave and a promise to bridge political divides. “It’s a play for the female vote that so far has not indicated they will be swept away in this clarion call to make history,” she said. But it’s also a tone that some Republicans embraced before Trump and a growing anxiety about terrorism pushed the party to more muscular rhetoric. And speaking to donors in the summer, New Jersey Gov. Chris Christie warned Republicans couldn’t win back the White House without making an emotional connection with voters: “We’ve got to crack our chests open and show ’em our heart,” he said.